Is a carbon tax back in play in Washington? A flurry of articles in the past few months suggests so. Carbon tax resuscitators include not just professional advocates like myself or trade journalists looking to churn controversy but highly regarded pundits like Washington Post blogger Ezra Klein and New York Times economics columnist Robert Frank. But why, after a hiatus of several years, are commentators and advocates again writing about carbon taxes? And why, over the past seven months, have Big Green groups, resource think-tankers and, gasp, a sprinkling of Republicans been conferring in Washington boardrooms to map a possible legislative path to a carbon tax in the next Congress or even in this year's lame-duck session? The answer is simple: revenue. A carbon tax set at higher-than-token levels will bring in big bucks. A U.S. tax that started at $10 per ton of carbon dioxide and tacked on another $5 each year — roughly what British Columbia has done since 2008 — would be generating over a quarter of a trillion dollars a year in revenue after a decade. Even if only a fraction of that revenue were used to reduce the deficit and draw down the federal debt, the contributions from this broadly based tax would be considerable. Such a tax would be no slouch in the carbon-reduction department. Based on my econometric modeling of carbon taxes and emissions at the Carbon Tax Center, I estimate that nine years after initial implementation, when the tax has grown to $50 per ton of CO2 (a level equivalent to roughly 47 cents a gallon of gasoline or 2.4 cents per national-average kWh), U.S. emissions will have fallen from last year's level by 600 million metric tons — a drop of nearly 11 percent — thanks to economy-wide changes such as less driving, more-efficient cars and trucks, electricity conservation and reduced use of fossil fuel power plants. That prospect is impressive, yet it's almost beside the point in Washington circles, where the dragon to be slain is the deficit, not climate change. Just as salient as the magnitude of revenue from a U.S. carbon tax would be its dependability. Again from Econ 101, R = P x Q: tax revenue equals price (tax level) multiplied by the quantity subject to the tax. The first element in the formula, price, is known since the tax level is set in the legislation. The quantity is almost as predictable; true, the elasticities that depict mathematically how fast the tax will erode demand and decarbonizes supply can't be pinpointed, but the error bands aren't terribly wide. Revenue predictability is a carbon tax's ticket into real-world discussions about deficit reduction and tax reform. Because the tax's revenue generation in any year can be reasonably known, it becomes a means to get things that legislators actually want — "pay-fors" in Congressional parlance: this chunk of the revenue can extend the payroll tax cuts, this piece can cut corporate taxes, that part can draw down the deficit, etc. 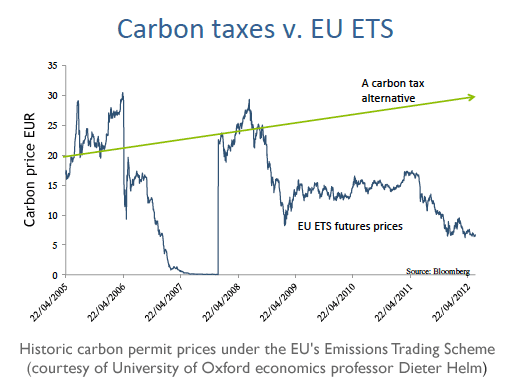 Note that cap-and-trade systems don't make this cut, due to of their built-in volatility — a result of the fact that the trading market, not the legislature, determines the price of the carbon permit allowances (see graph). Nor can non-pricing approaches for reducing carbon play in the deficit-reduction and tax-reform game. Carbon regulations like CAFE standards for passenger cars generate zero revenue. Even worse on that score are clean-energy subsidies like the Production Tax Credit for wind power, which siphon revenue from the Treasury. If anything drives Congress to a carbon tax, then, it will be fiscal policy, not climate policy. By itself, the looming fiscal cliff noted by WaPo blogger Ezra Klein won't ensure that Washington enacts a carbon tax. But at least, and at last, the conversation is beginning. Policy-analyst and activist Charles Komanoff, a lifelong New Yorker, directs the Carbon Tax Center and develops traffic-pricing modeling tools for the Nurture Nature Foundation.